Paleo diet foods are known for offering tons of satiety. This means that they are filling and super-satisfying. 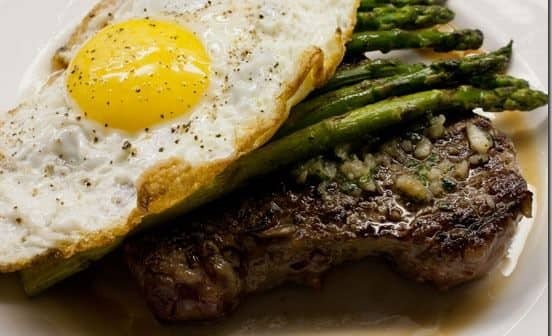 If you’re interested in learning about Paleo lunch recipes, you may want to start with our Steak with Eggs recipe, which is definitely filling, as well as nutritious. Once you see how simple it is to prepare, you’ll probably want to add it to your Paleo diet meal plan. Now, let’s talk about how to prepare this time-honored classic, which is definitely compatible with Paleo diet guidelines. First, choose a nice steak. What you select will probably depend on your budget – any type of steak will work. You’ll do better with a cut of steak that you’re used to preparing. Recommended choices include filets, sirloins and ribeyes. Next, select a cooking fat which works for you – butter is probably the most popular choice. Lastly, you’ll need a couple of eggs. In terms of spices, it’s really up to you. Some people enjoy adding Paprika, while others go for basic salt and pepper. To prepare, heat some butter in a pan and then add the fat of your choice. Once you’ve done this, cook your steak to a preferred level of doneness. Once it’s cooked to your liking, add salt and pepper or a pinch of paprika to the pan. Then, stir it around. After you’ve completed this step, remove your cut of meat from the pan and set it aside. Then, lower the pan temperature – medium-low will work perfectly for the next step. Once the pan temperature is adjusted, crack the eggs and cook them until the whites of the eggs are firm. 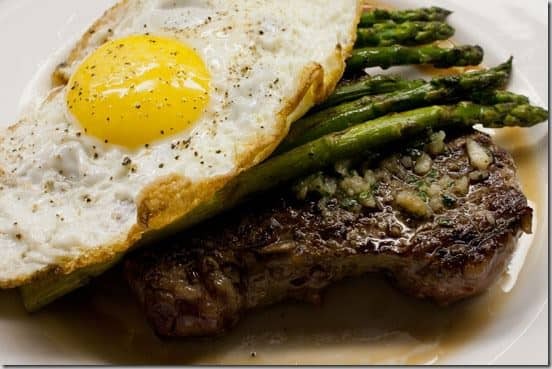 Then, place the eggs on top of your steak and enjoy. This lunch classic is easy to prepare at home. This recipe will keep you full, which may help you to attain your weight loss goals. In addition, it is loaded with protein and vitamins, so it will make you feel great. One tip is to trim the fat from your steak before you cook it. This will allow you to get more lean protein and less of what you don’t need.